Avon Fire & Rescue Service (AF&RS) is donating old firefighting hose to two animal attractions in the local area. Due to firefighting activities, hose can suffer damage. 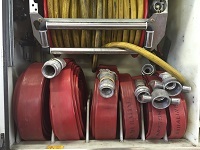 Although some damage can be repaired, more serious defects mean the hose falls below the standard required to fight fires which means it must be disposed of. All hose used by AF&RS is regularly inspected and tested. Following the most recent checks, hose that didn’t meet the required grade was withdrawn and, as part of the AF&RS commitment to helping the environment, will be donated to Bristol Zoo Gardens and Noah’s Ark Zoo Farm for use in their various animal enclosures. The hoses will be used by Bristol Zoo Gardens to provide enrichment for the animals in its care. Richard Switzer, assistant head of the animal department and curator of birds at Bristol Zoo Gardens, said: “We are hugely grateful for the hose donation from Avon Fire & Rescue Service. This is a great example of sustainable practice as the hose will be recycled and used to create a whole host of enrichment objects for our animals, including hammocks, swings and puzzle feeders. At Noahs Ark Farm Zoo the water hoses will be used to enrich the lives of the 100 acre park’s newest arrivals – the popular Spectacled bear brothers Tupa and Sonco who live in the recently completed 2 acre Andean Adventure habitat. Keepers will make special hammocks for the bears who enjoy climbing and relaxing in high vantage points, helping to simulate their natural aerial behaviours in the Andean mountains in South America. Noah’s Ark will also make hanging toys for their primates including endangered Siamang gibbons and two species of lemur. Each attraction will receive 23 metre lengths of various types of hose (70 millimetre, 45 millimetre and 19 millimetre diameter hose).